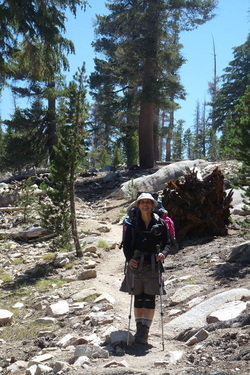 Pamela Zoolalian decided to walk 272 miles along the John Muir Trail: from Yosemite to Mt. Whitney, in an effort to raise $5,000 for Aspire2Be. At no time could I ever have imagined the door I would open by taking this adventure. Or how it would unfold. The idea from the beginning was a big one. From food dehydration, to the planning & the commitment of friends meeting me on the trail for food resupply. This was beyond big! Even the amount of steps from start to finish, Yosemite to Mt. Whitney: Or the incredible mountains I was surrounded by daily. This really was an adventure of epic proportion. I didn’t know what I was about to embark on or the world I’d be walking into. I didn’t know how full my heart was going to get. But I do know that with every step further into the mountains I became more full as I breathed it all in. When you head into the woods solo for 30 days you have to guess that you might experience some loneliness; but to my amazement I was more connected during this time. I was connected to the beauty around me. To nature. To the other JMT hikers I would meet along the way. It was as if we were one big heart and soul of the Sierra’s. You could really feel the presence of everything around you. It was something so powerful. So beautiful. So amazing. Even now I feel the pull of the mountains calling me. It’s pretty incredible to live so simply. Walking until you see something so beautiful you have to stop. Eating when you are hungry. Sleeping when you are tired. I had this idea before I left that my mind would be filled with my LA life and the things I need to do or get done. But that never happened. I was absolutely present in every moment; like a walking meditation. What a gift nature gave me. This hike was not easy. Some days were more challenging than others. But the support nature showed in the way of; Aspin Tree’s applauding you as the wind kicked when you needed a little push. Or a long awaited vista that took your breath away then returned it in the greatest fashion. Or even the Pika (a little round critter with Micky mouse ears), birds, Marmot, Chipmunks, deer and bear that greeted you with a look of welcome. Those moments made every challenging step worth the struggle. I think the most beautiful thing was every person I passed on the trail took the time to talk, ask questions, learn about me and know me. Let me learn and know about them and be connected. The truly amazing part was that hikers I had spoken to who were walking faster then me would ask hikers who were headed in my direction to say Hi. I was greeted more than once with a “You’re the girl in the hiking skirt, you must be Pamela, Hi” by a new face. I was actually given the trail name “Pamela Angel” because I always shared the little extras that I did have in the way of chocolate and goodies. I feel a bond with every one of those people. Their smiles and laughter and stories are etched into my mind and apart of that moment. I feel blessed to have had the opportunity to take this walk, this journey. I am grateful to those friends who encouraged me and helped make this hike a reality. Without their support this would only have remained a dream. Thank you beautiful friends! As john Muir would say: Going to the mountains is going home. These mountains will see my smile again! I have so many photo’s. If you would like to see images from my adventures, please go to my google+ My John Muir Trial photo album. 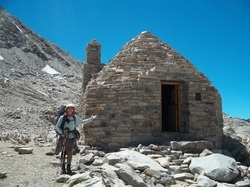 My John Muir Trail Adventures on my tumblr.